The UTC TDA7388 is a class AB Audio Power Amplifier. It allows a rail to rail output voltage swing with no need of bootstrap capacitors for the fully complementary PNP/NPN output configuration. 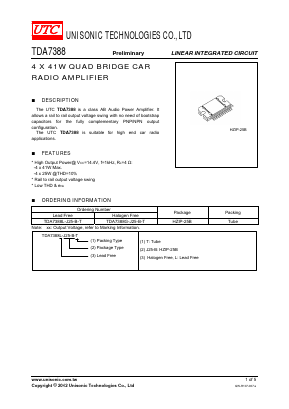 The UTC TDA7388 is suitable for high end car radio applications.